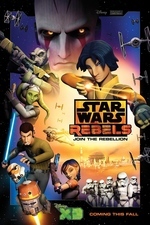 Reacting to a vision of Maul, Ezra defies Hera and Kanan to travel to a remote planet in hopes of stopping the former Sith lord. I was genuinely touched by this. The Dathomir arch going back to the clone wars show (and I suppose the Phantom Menace) is really tragic and brutal. There was never going to be a happy ending, but this was a fitting one. Also if lightsabers existed, I imagine this is how 80% of lightsaber fights would go. This was very good except for all the parts with Ezra.